Normally, when you display a TreeView, the nodes are collapsed by default and the user clicks on the expander widgets to expand nodes that they want to look at. You can expand all nodes in the TreeView by default by setting up an ItemContainerStyle for the TreeView and specifying that you want each TreeViewItem expanded. Below, we show the first part of a TreeView definition in XAML, referencing an ItemContainerStyle (data templates are not shown). In the style, we simply set the IsExpanded property to true. Now, at runtime, all of the nodes in the TreeView are expanded by default. You can use a trigger to change some property in an Expander whenever the Expander is expanded. You set the trigger to react to a change in the IsExpanded property. 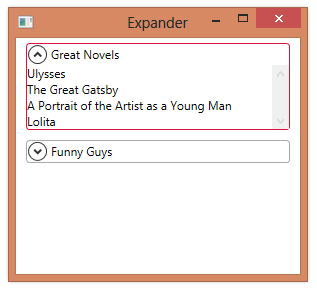 In the example below, we define a trigger that changes the border color for any expander that is expanded.